Apple's new payments service launched on October 20, and Cook said users activated 1 million credit cards in the the first 72 hours. The number sounds impressive, and Cook said the early ramp-up looked “fantastic,” but keep in mind that Apple sold 39 million iPhones worldwide last quarter. While some of those phones are older models that don't support Apple Pay, and the service itself is only available in the United States, Apple will have to battle some user inertia as it tries to get people to register their cards. Just a year ago, Cook was saying that television was “an area of intense interest” for Apple, but he struck a subtler tone at the WSJD conference. While he made the obligatory nod to the awfulness of the current TV experience, he shied away from saying Apple could do anything about it, as he has in the past. Striking reasonable deals with content providers is tricky, and there are no signs that Apple is making much headway. 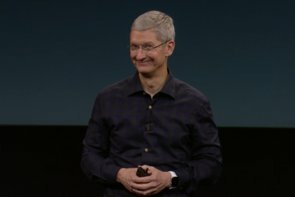 Although Apple is trying to pitch itself as a protector of privacy and security, recent breaches have put a ding in the company's reputation. Cook said Apple is designing a “Fort Knox kind of thing” to enhance user privacy, but he didn't get into details. Cook also took several indirect jabs at Google (“We're not Big Brother … We'll leave that to others.”) so it's no surprise Apple is looking at new ways to distinguish itself on the privacy front. This isn't news, in other words—and it's still unclear how much screen-on time users should expect if they want the Watch to last until bedtime.